In my speech at Don't Panic's Guide to Crisis Communications last month, I argued that many crises these days are created by organisations' own announcements and initiatives rather than coming out of a clear blue sky. So it proved for Archbishop of Canterbury Rowan Williams yesterday. A speech to lawyers and accompanying BBC interview, in which Williams called for certain aspects of Islamic Sharia to be recognised in the UK, has caused uproar. I'm not going to rehearse the arguments about Sharia law here. I've long been suspicious of the entanglement of church and state, and frustrated by the fact that the largest country in the UK, England, retains an established, state church - the Church of England. No, my focus here is how the Archbishop, an intelligent and decent man, failed to anticipate the strong reaction that such comments would attract, especially from the more rabid section of the media. (The BBC suggests he has been shocked and overwhelmed by the hostile reaction. Does he not have PR advisers? If he does, it's hard to believe they failed to warn that this was hugely controversial territory. Today, the Archbishop of Canterbury's website tried to set matters straight by explaining what Williams actually said. "Rowan Williams has a knack for creating problems where none yet exist. Prodding, however thoughtfully, the humming nest of multiculturalism and the law, the archbishop has provoked a predictable media storm that in the short term will only obscure his intention of promoting cultural cohesion - as well as confirming his critics' frustration with his apparent lack of common sense. His arguments, mildly and carefully expressed, will simultaneously stoke tabloid fears and infuriate those who believe that the state should be as far from religion as possible." That comment also underlines how even archbishops need wise counsel if they are to get their views on major society issues across to fellow citizens, many of whom are agnostics and atheists. Sermons and lectures are not enough. Back from holiday, and a near encounter with the biggest news story of last week. 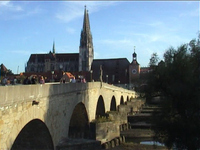 It was pure chance that we decided to stay the night in the Bavarian city of Regensburg. We were travelling from the beautiful Czech city of Cesky Krumlov to the equally historic German city of Esslingen. Regensburg looked a worthwhile stop-over with the oldest bridge over the Danube, dating back almost 900 years, and a miraculously surviving medieval altstadt. Knowing how German cities shut down for the weekend, we were amazed to find the place buzzing. Shops large and small were open - at 5.30pm on a Sunday. We were curious to see television film crews and their lighting rigs everywhere. Then we saw the bunting and the penny dropped: the Pope was about to arrive in town. I wish I could give you an eyewitness account of the controversy that unfolded when the Pope arrived. But we left hours before the visit began, passing on the autobahn dozens of police cars heading from Munich - where the Papal tour of Bavaria began. It's the second time in my life I've nearly witnessed a Papal visit: I watched Pope John Paul II's visit to Cardiff in 1982 on television as I prepared for my A levels in the Welsh capital. That Papal visit to Britain was also controversial: Britain was at war following Argentina's invasion of the Falkland Islands and the Pope felt obliged to arrange a swift 'balancing' tour of Argentina.